As a nutrition major, I get asked the following question quite often: what is your favorite food? My answer is always pasta, whether it be the comfort food macaroni and cheese or a plain farfalle with olive oil, cheese, and black pepper! I simply love pasta and all the ways in which you can use it. I’ve even had experience making my own pasta from scratch, which turns out to be harder than you think (you seriously need some arm strength to flatten the dough to make it thin enough). 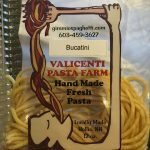 Because of my love of pasta, you can imagine my shock and happiness to find that our very own farmers’ markets (Rollinsford and Exeter) have their very own pasta farm vendor: Valicenti Pasta Farm. I was beyond ecstatic. Just looking at the farm display is wonderful. They lay out each of the day’s pasta in an artistic way. They have pasta shapes and flavors that I have never seen before (like the beet twists)! They also make homemade sauces as well. The pasta I used for the Spaghetti Experiment (previous blog) was Bucatini (a hollow spaghetti). It was delicious and very easy to cook! Because fresh pasta is not dried, it takes a lot less time to cook and is even more delicious. When I talked with the farm stand, they gave me some more information that made me love this farm even more. 90% of the vegetables and herbs used in the products are grown in a giant greenhouse the farm owns! This means that they can have herbs all year long! Furthermore, the owner of the farm, David Valicenti, used to be the head chef at a Cajun restaurant in Louisiana. Armed with this cooking experience and also his Grandmother’s sauce recipe, Valicenti was able to create Valicenti Pasta Farm and make it the success it is today! Some of the farms best sellers include brown butter & sage roasted sweet potato ravioli, wild garlic scapes tagliatelle, and fresh herb pappardelle. 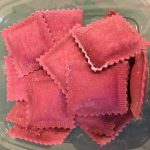 I made their roasted beet & pecorino toscano ravioli earlier in the week and it was delicious! No seasoning was needed! It was extremely easy to prepare and had a beautiful deep magenta color from the beets. This pasta also tasted extremely fresh, unique, and exotic. 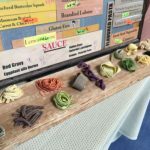 I encourage you to visit Valicenti Pasta Farm (gimmiespaghetti.com) at the Exeter and Rollinsford winter farmers’ markets. I look forward to learning about and tasting the other pastas this farm provides and encourage you to do the same. If you do happen to visit this fantastic farm, comment what type of pasta you tried and how you liked it!